Look what I just picked up from a guy in Tasmania today , it's a Vixen Super Polaris 100mm f10 model # R-100L she should be with be in about 10 days and I am quite excited about scoring this beauty , for a sum total of $350aud delivered !!! 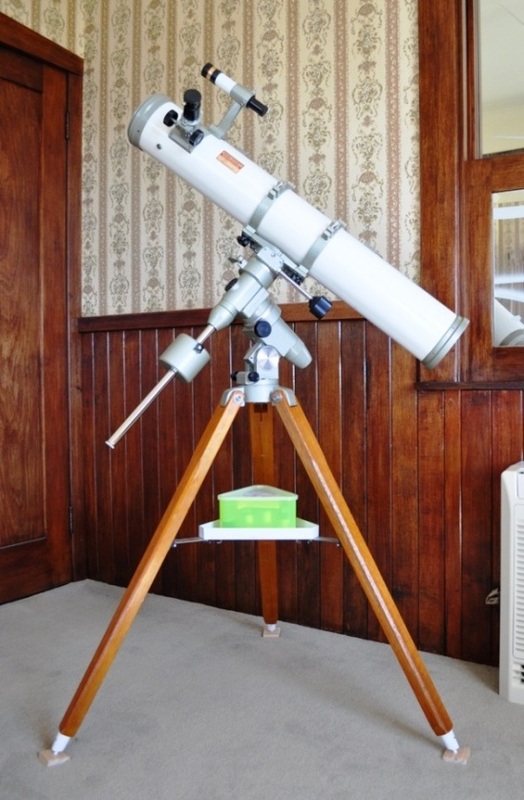 that's only $262usd and it looks in great condition , complete with ' Tupperware' accessory box , 3 eyepieces and origonal recipt from when it was brought new , so cool . 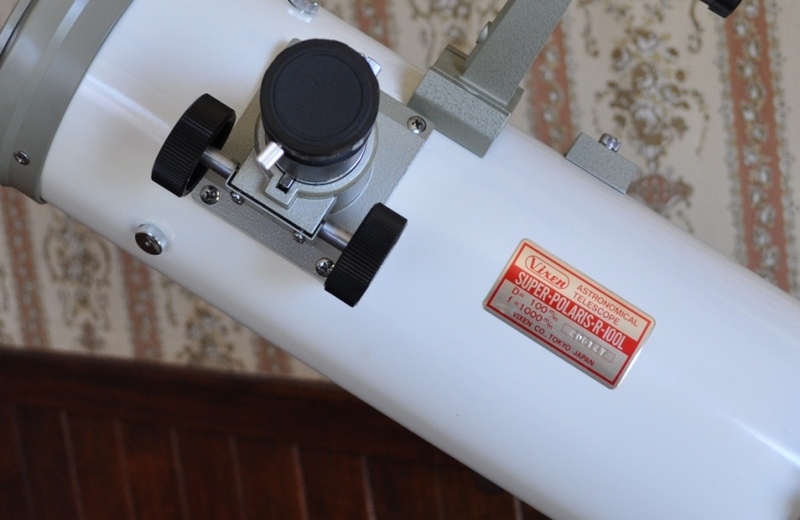 Photos are of the scope taken by the seller and I will post more and with a review when she arrives . 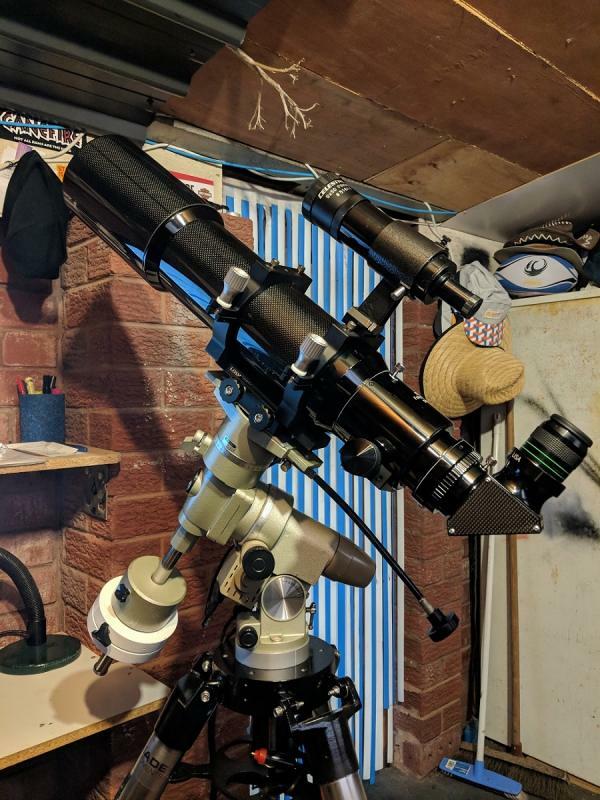 One thing , in all my years of being into astronomy this will be my first Vixen OTA , as I have and love my SP mount under my new to me LP 110mm f6 APO , these are an awesome mount for sure . Cant fit all 3 photos , so they have to go seperately . Edited by beanerds, 06 November 2018 - 03:27 AM. I can't wait for more pics. This picture shows an uncommon Vixen green, more of a grey-green, Super-Polaris mount. I consider myself a certified vintage Vixen fan boy. In the last 1/4 of the last Century Vixen did not do everything right or perfect, but they did a lot things first. Li'lgreenman , yes you are right , I never noticed untill you mentioned it , here is my SP in standard Vixen ' Green ' under my LP 110mm APO , I really like these mounts and over the years had quite a few Chinese copies , the EQ3's and 5's ( CG's ) and these Vixens are way better in all ways . Can't wait for 1st light . Edited by beanerds, 06 November 2018 - 04:48 AM. That is a beautiful scope. Congratulations on your wonderful find. Like LGM, I’m looking forward to more pictures when you receive it and hearing about your observations. I bet it will be a great performer. 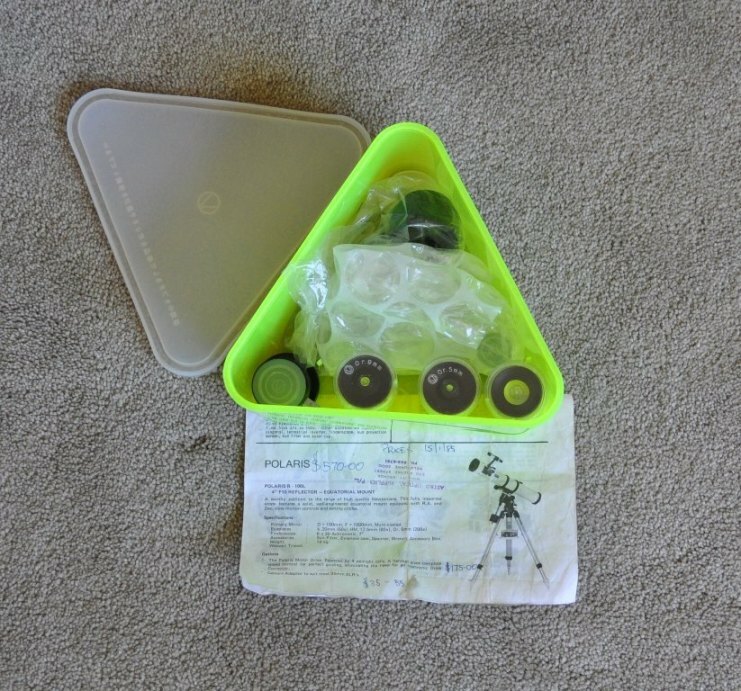 Wow, green tupperware even! Mine is just neutral. Littlegreenman likes green Tupperware. Especially the Day-glo (fluorescent) variety! The color on these mounts can appear more to the greenish or the gray side, depending on the illumination. Congrats on finding a wonderful piece of Astro History! A real keeper there. I have a couple extra RA and Dec motors, all you need is to source a hand control. The issue with the Super Polaris/Vixen drive systems from about 1985 are they are a NEG tip plug. Many people use a POSITIVE center tip and it burns out the protective Diode on the board. This is a simple fix and most non working hand controllers can be salvaged!!! let me know and you can have these for shipping. Thanks all for your kind and encouraging words , yes I am looking forward to seeing how this stacks up against my very good Saxon 102mm f10 achro , will be a fun comparo . Larry , I have read somewhere about the NEG tip on Vixens and forgotten so thanks for the reminder ,the DMD-3 duel axis drive on my SP is a great performer , tracking brilliantly when set south properly , super smooth with nearly instant directional changes showing the quality of Japanese workmanship here . Looking forward for sure , and yes Tarra , a real bit of history that will be looked after by me for a long time , such a cool looking scope that should perform as well as it looks . Thanks again , all . Thanks Larry , I will be in touch on your kind offer very soon . thanks again , your new friend Brian. Yippee ! the 2 boxes are on the mainland , on their way across country as I type , should be here next Wednesday ,,, looking forward to testing this beauty out . ps. Devonport and Launceston are in Tasmania . Edited by beanerds, 15 November 2018 - 02:46 AM. Beautiful looking mount and scope! Congrats! Very nice!!! What a cool telescope! Great find! That SP R-100L is super-dooper sharp looking! When you get a chance, please post its serial number, and I'll get it Registered. IIRC, Terra's praise for the Celestron / Vixen Polaris C4.5 got me interested in them, and I've held on to the mirror set that came with the first Polaris mount that I bought. Before I recycled that China-made 114 for my Edmund Cassegrain, I popped those optics in, and confirmed their excellent performance. Now I have an "insurance policy" if I decide to sell my Mizar P-100 kit -- another great Japanese reflector. Edited by Bomber Bob, 15 November 2018 - 12:29 PM. I have and SP and a GP one with vixen motors and a DMD3 and the other with a modded Orion drive motor. Both work well, but the Vixen uses batteries up much faster. 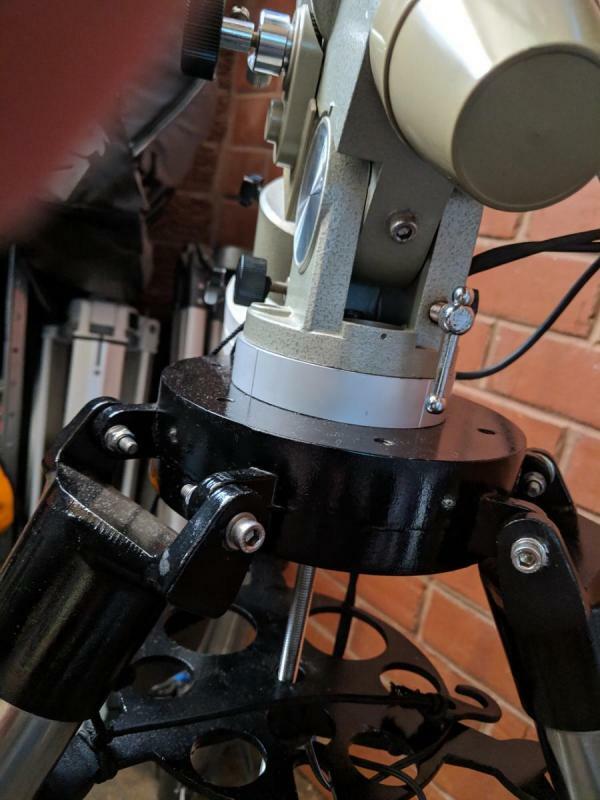 What sort of adapter are you using to mate the SP head to the Meade Tripod? That looks like a very solid combination. I too have a SP, had it for under a year and really enjoy using that mount. I did update the polar finder reticle, and added DSC's to it... one of these days it might get a re-lube, but it keeps soldiering on. 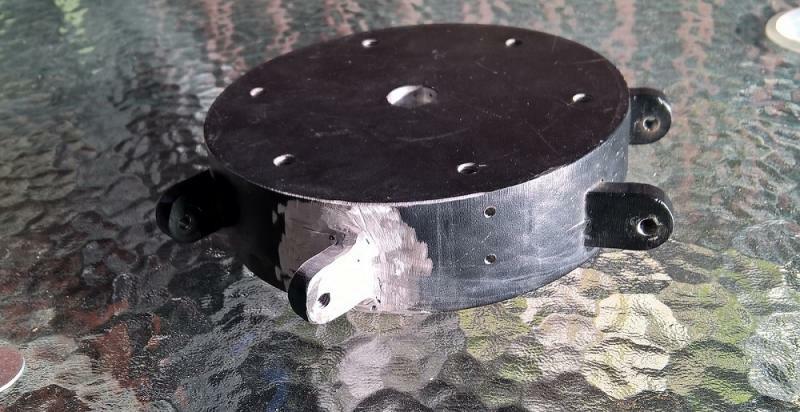 I just cut off a 20mm ( 3/4 inch ) long piece of alloy round stock of 102mm ( 4 inches ) in dia and machined a 60mm hole in it for the male part of the SP mount base to fit into . I then drilled and tapped a 10mm thread in the right position for the AZ adjusters and cut the head off a M10x30 S/S bolt that was then screwd in for AZ adjustment ( if needed ) , I then used a length of 10mm S/S threaded rod 275mm long to secure it all together as the mount never came with the standard long holding down bar but it did have the spreader ( the tripod was free and broken when I got it ) and it works well as a unit and as you say ,,, it's very SOLID ! . Here is also a photo of the repair after welding ,,, before cleaning and painting . Edited by beanerds, 16 November 2018 - 02:00 AM. Will do Bob , I am so looking forward to testing this baby out . Many thanks for the info, I figured it was a commercial product... but that is some good 'ole diy. I’ve gotten rid of all my smaller Newts. Sold the Vixen C4.5 and the 3” F6 Edmund, and gave away the old Meade Polaris 4.5” F8 and the Edmund 4.25” F10. I just didn’t see the performance from them that I get from a good 3” or 4” apo or my little C5 so off they went. The only Newt that remains in my collection is my trusty 6” that I built 1967. I do have a nice 115mm 1/8 wave parabolic mirror set sitting in a box but none of the parts for a build. I’ll probably just keep it as a reference optic for testing and demonstration. Edited by donadani, 16 November 2018 - 02:03 PM. Any colour you wan't so long as it's black ,,, looks stealth . But, I'm am not promoting this scope for sale! That would be a violation of the TOS. * Nope, I thought comparing this Mizar to the Vixen would be interesting. This one has a pier. The Vixen looks nicer to me. There, the TOS are happy. Edited by Littlegreenman, 18 November 2018 - 05:38 PM.